A new 26.29 metre Sunseeker motor yacht has been listed for sale by Christopher Head at Sunseeker London and is available for delivery now. Built in GRP by the British yard Sunseeker International, she was launched earlier this year as a Sunseeker 86 model. An interior in black American walnut comfortably accommodates eight guests in four cabins consisting of an amidships master suite, a forward VIP suite and two twin cabins aft. All guest cabins have entertainment centres, Samsung television screens and en suite bathroom facilities, and there are crew quarters for up to four staff aboard this yacht for sale. The generous main saloon has large settees to port and starboard plus armchairs and a bar along with an entertainment centre including a Bose stereo surround sound home cinema system and there is tropical air conditioning throughout. Forward is a formal dining area seating eight guests while further forward still is a breakfast bar on a raised plinth to maximise views through the ports. Outdoor spaces are ideal for sun worshippers, including an aft deck with built in upholstered seating behind a table on a stainless steel pedestal and a teak deck while the foredeck has a sunbathing area that comes with a removable parasol. Up on the flybridge, she offers a barbecue, full wet bar with three bar stools, built in upholstered seating and a table for al fresco entertaining and dining, and a custom hard top to offer relief from the sun. Twin 1,950hp MTU diesel engines deliver a top speed of 30 knots and a range of 1,500 nautical miles at 10 knots. 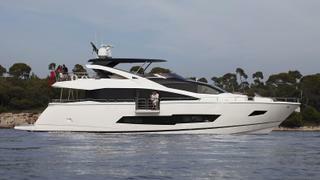 The asking price of the Sunseeker 86 is available on application.